My friends, I am an iPhone/Facebook Games addict. I really believe it’s because my mom tried to make me an absolute “girly-girl” and did not get me Nintendo and Playstation in my childhood. So now, my gaming senses are on overdrive..through these games. That’s my only reason for getting the iPhone cos the graphics are pretty good for my GAMES. Hehehhehe ready for my guilty pleasure list? Here goes..
OMG…this game is so addictive. The title sounds lame but you basicly catapult birds to kill the pigs who stole their eggs. IT IS NOT THAT EASY. Each bird has a different power e.g. ‘suicide bomber,drops a bomb, speed etc and the pigs are strategically positioned with limited amounts of birds per level. Altogether, there are 5 main levels with 30 sub levels so you really get your $0.99 worth for long strategic gameplay especially at the higher levels. Yes, I buy the full versions after I tried the lite/free versions. THIS GAME IS MY LATEST LOVE. The storyline and gameplay is fantasic! You’re a pizza delivery boy whose aim in life is to be a surgeon but he runs over a disgraced doctor. Using his every day tools e.g. pizza cutter and stapler, he performs SURGERY on the doctor and gets more patients in the make-shift clinic. Play the free online trial game here to get a feel of the game. 3. 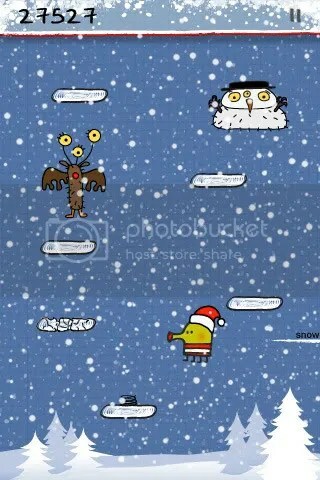 Doodle Jump – You gotta pay for it but it’s WORTH IT. Ahhhhh sooo addictive. This is such a simple game. So simple, you feel stupid for not beating your score the next time round. Just get the doodle to jump as high as possible. The higher the jump, the higher the score. You even get cheats like a rocket backpack, spring shoes and a propeller hat to use!!! 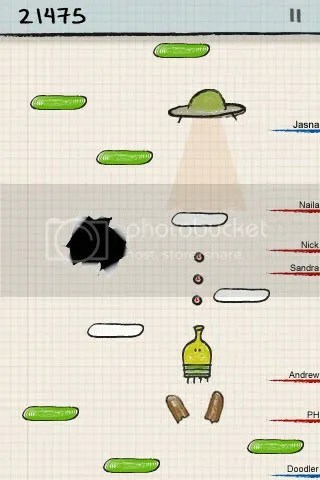 Just dodge or shoot the aliens and avoid the infamous BLACK HOLE. This game is pretty straightforward. Get the vehicles to cross the junction withing crashing them. Sounds easy? It’s moderate BUT if you can coordinate the vehicles, you are screwed 🙂 The cars will just keep coming at different speeds and you gotta get them over fast enough. Another game from the makers of Traffic Rush. Mow the lawn without hitting the hedgehogs and guard dogs. The longest possible stretch of grass you get without going over the dog or the same area, the more points you get. Not so easy as there are areas you gotta find to press a button to get to different sections so, high chance you gonna cross the same area twice. Nice Blog dude 😀 , Bookmarked ! !